by Christine Kenny-Sheputis. Liturgy Training Publications, 2007. “I prefer to cut children’s spiritual garments a little large, for them to grow into….” With this quote from Dorothy Coddington, Christine Kenny-Sheputis begins a journey through the church year, one liturgical signpost at a time. Each of sixty reproducible handouts features a tradition or saint related to the liturgical or popular calendar. Some, such as All Saints Day and Pentecost, are recognized by a range of Christian traditions. Others, such as All Soul’s Day (November 2) and Martinmas (November 11) will be new to many readers. Popular US holidays Martin Luther King Day, Independence Day and Mother’s Day all get a page, as does the Jewish festival of Sukkot (“Harvest Homes”). Each entry is richly illustrated, with age-appropriate activities. Originally published in 1991 and re-introduced in 2007, this inclusive collection is both classic and fresh. 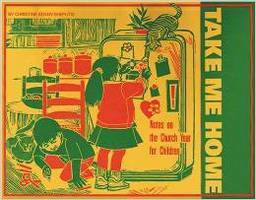 It is addressed to Catholic children but would find welcome across the liturgical spectrum.